Squeaky wheel, meet grease. 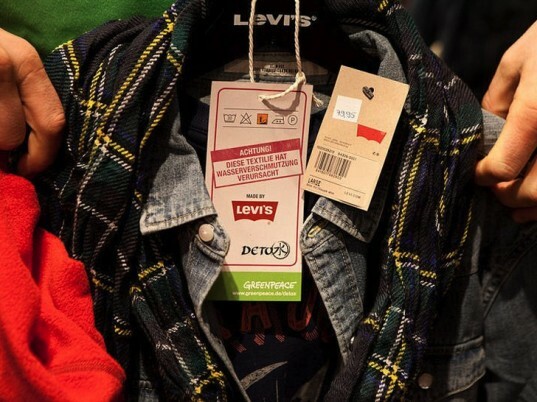 After a week of relentless campaigning by Greenpeace’s “Detox” initiative, Levi Strauss has finally committed to eliminating all releases of hazardous chemicals from its products and supply chain by 2020. The world’s largest denim brand announced Thursday that it will require 15 of its largest suppliers in China, Mexico, and elsewhere in the Global South to disclose pollution data as early as June of next year. Another 25 major suppliers will follow suit by the end of 2013, providing communities living in or around discharge sites with crucial data about pollution in their local environment. Levi’s has also promised to ban alkylphenol ethoxylates (APEOs), which scientists describe as “highly toxic” to aquatic life, as well as replace all perfluorinated compounds (PFCs) with fluorine-free alternatives by the end of 2015. Levi’s pledge comes just eight days after Greenpeace released a report about the wide range of hazardous chemicals in the wastewater of two of the Mexico’s largest garment factories, which have turned the nation’s waterways into a toxic stew of persistent environmental contaminants with hormone-disrupting properties. Levi’s is the eleventh brand to make a “credible commitment” toward zero discharge of toxic chemicals. But eliminating hazardous substances isn’t the denim giant’s only goal. Levi’s declares that it will also support “systemic	(i.e., wider societal and policy) change” to encourage industry, government, science, and technology to head in the same direction, according to a press release. The label is the eleventh brand to make a “credible commitment” toward zero discharge of hazardous chemicals since Greenpeace launched its Detox campaign in 2011. Other brands that have made similar pledges include Adidas, C&A, Esprit, H&M, Li-Ning, Mango, Nike, Puma, Marks & Spencer, and Zara. Sooo Levi's are going to be toxic until 2020. Noted. Squeaky wheel, meet grease. 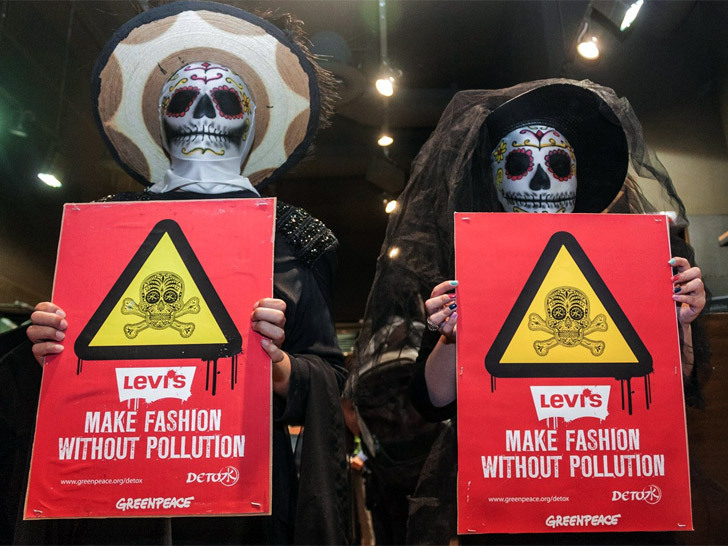 After a week of relentless campaigning by Greenpeace's "Detox" initiative, Levi Strauss has finally committed to eliminating all releases of hazardous chemicals from its products and supply chain by 2020. The world's largest denim brand announced Thursday that it will require 15 of its largest suppliers in China, Mexico, and elsewhere in the Global South to disclose pollution data as early as June of next year. Another 25 major suppliers will follow suit by the end of 2013, providing communities living in or around discharge sites with crucial data about pollution in their local environment. Levi's has also promised to ban alkylphenol ethoxylates (APEOs), which scientists describe as "highly toxic" to aquatic life, as well as replace all perfluorinated compounds (PFCs) with fluorine-free alternatives by the end of 2015.